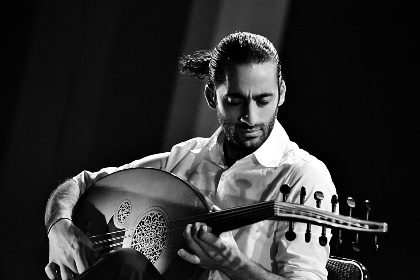 For over a decade, the brothers Samir, Wissam and Adnan Joubran have been expanding the borders of contemporary oud music with their Trio Joubran, touching down in some of the world’s most prestigious venues and composing music for award-winning films. Now, after ten years of Parisian life, younger brother Adnan is expanding his own musical identity alongside his ongoing project with the Trio. 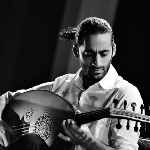 His debut solo album, aptly titled Borders Behind, is the fruit of two years of experiments based on merging traditional oriental music with Indian, flamenco, jazz and classical influences embodied in the virtuosic playing of his colleagues. It’s a unifying music, free-flowing and soulful, suffused with the spirit of respect, love and hope.